WonderWoof - We’re a small team with big dreams who are passionately creating wearable and connected devices to help pets lead happier and healthier lives. We’re a small team with big dreams who are passionately creating wearable and connected devices to help pets lead happier and healthier lives. We’re a small team with big dreams who are passionately creating wearable and connected devices to help pets lead happier and healthier lives. We seek to create beautifully designed accessories that empower the individual and use technology to bring us all closer together. 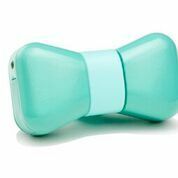 WonderWoof is a dog activity tracker, monitor, and social network that connects the BowTie device to the WonderWoof app on your phone. It monitors your dog’s activity in real time, helps improve their health, and allows you to meet other dog-lovers in your area.